Have your gift giving ideas gone stale? The last thing your friend, coworker or loved needs is another candle or sweater. What better way to begin the New Year but with a gift from Fountain of Youth? Down here in Southern Alabama bikini season is never far from anyone’s mind. Instead of a gift certificate to a gym that may never get used, try our new EMsculpt device. This non-invasive procedure targets fat and muscles by delivering the effects of 20,000 sit-ups or squats (excluding the the sweat and effort)! Do you know someone who always feels tired or sluggish? They may not be getting the right amount of fluids and vitamins needed for optimal health. IV Hydration works by infusing the body with 100% of much-needed nutrients for maximum absorption. This process allows for faster and longer lasting results. Give someone that New Year glow with one of our many popular aesthetic services. Our treatment options include chemical peels, dermaplaning and permanent makeup. Each one is guaranteed to give you a rejuvenated feeling and enhanced youthful appearance. Know someone who suffers from skin problems or wants to reduce the appearance of fine lines and wrinkles? A gift of one of our laser facial treatments will get them glowing. Our professionals use a high-frequency treatment to stimulate cell renewal by warming the tissues of the skin. This process also helps fade dark circles and reduce the appearance of puffy eyes. Our laser hair removal treatment is perfect for anyone who shaves. Our technique involves highly concentrated light that is beamed onto the hair follicles. The follicles’ pigment absorbs the light, destroying the hair and preventing regrowth. Laser hair removal is one of the most popular cosmetic procedures used by both men and women. Crow’s feet and frown lines are an unwelcome sight at any age. Smooth out those lines with our Botox injection services. This simple cosmetic treatment targets those muscles and reduces their activity resulting in a much smoother appearance. Sometimes those lines may be deeper than they appear. A Juvederm procedure is a gift that keeps on giving because the results can last up to a year. Our process involves hyaluronic acid dermal fillers, an excellent source for filling for those deeper folds around the mouth. We offer a variety of Yoga and Zumba classes for those wanting to jumpstart their fitness routine. Our Pilates Barre Fusion classes will tighten and strengthen muscles for a better-toned look. 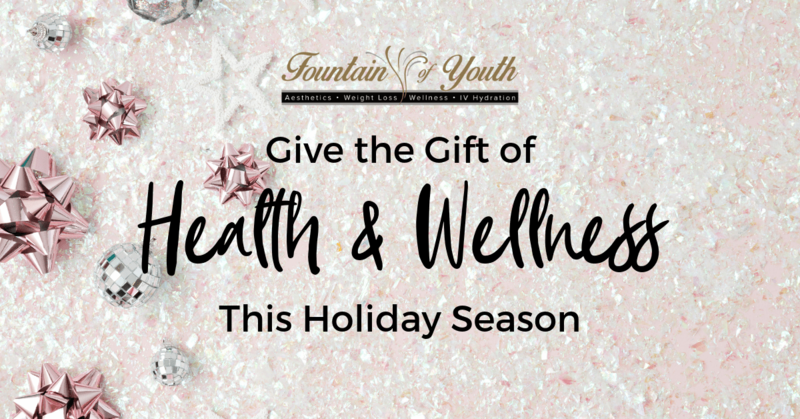 Treat your friends, family or coworkers to any one of our health and wellness products at Fountain of Youth for the holidays. Our gift cards make the perfect present for anyone who wants to be on the road to a healthy and stress-free New Year. Visit us at 6729 Spanish Fort Blvd. Ste BC in Spanish Fort, Alabama, call us at (251) 525-8446.